The better Nexus. 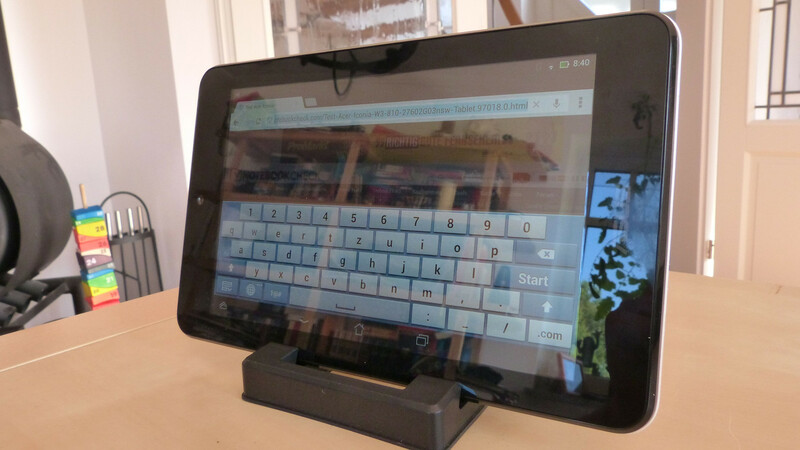 For a year it was very hard to get a high-quality tablet for less than 200 Euros (~$265) without the Nexus 7 branding. 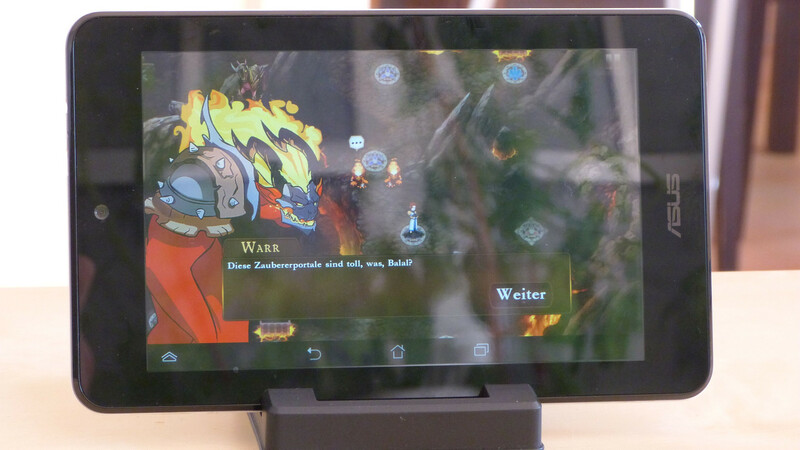 Right at the launch of the second generation Nexus 7, Asus now offers its own tablet for 149 Euros (~$197). While the market for high-priced tablets is dominated by Apple, more and more manufacturers offer low-priced Android tablets. Besides typical low-cost suppliers like Archos there is an increased number of familiar manufacturers. 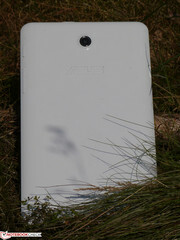 The most prominent example: Asus. 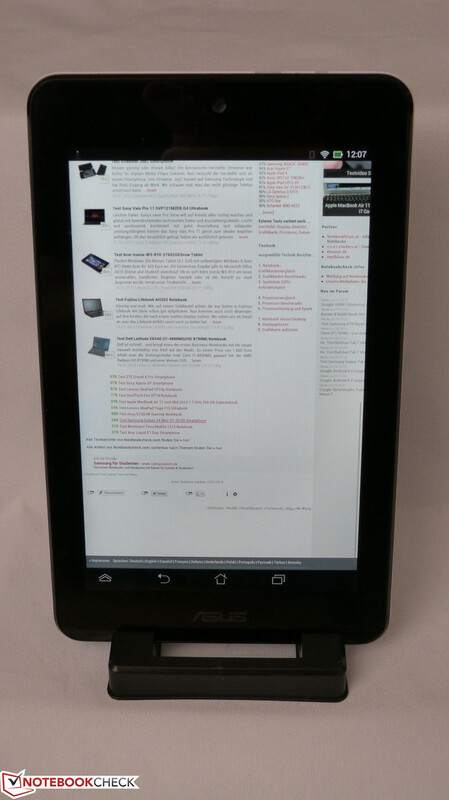 The manufacturer brought the competition to a whole new level for cheap tablets with the Nexus 7. After the unsuccessful attempt to offer an inexpensive tablet with the Memo Pad ME172V, Asus now tries again with the Memo Pad HD 7. Asus uses an ARM A7 quad-core SoC from Mediatek (MTK8125) with a clock of 1.2 GHz supported by 1 GB RAM. The Memo Pad HD 7 is exclusively available with 16 GB internal storage for 149 Euros (~$197) in some countries. One advantage compared to the inexpensive Google device is the micro SD slot and a back camera with 5 megapixels - and finally the lower price point. Did Asus really create competition for themselves? Nice from above but only plastic underneath. 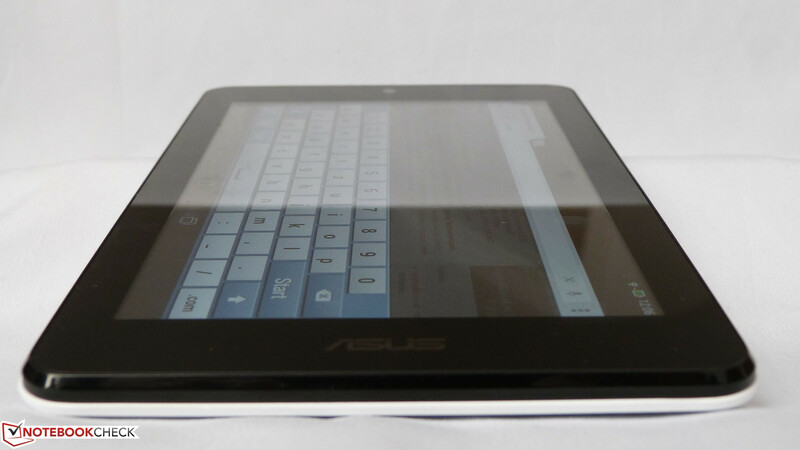 There are no real surprises when it comes to the case of the Asus Memo Pad HD 7. A closer look reveals a lot of plastic and the back is now smooth and not roughened anymore. Thanks to its low weight of just 300 grams, the tablet is very comfortable in the hands; even Google's Nexus 7 is another 40 grams heavier. The tablet would be great as an all-day companion if it was a bit more robust. 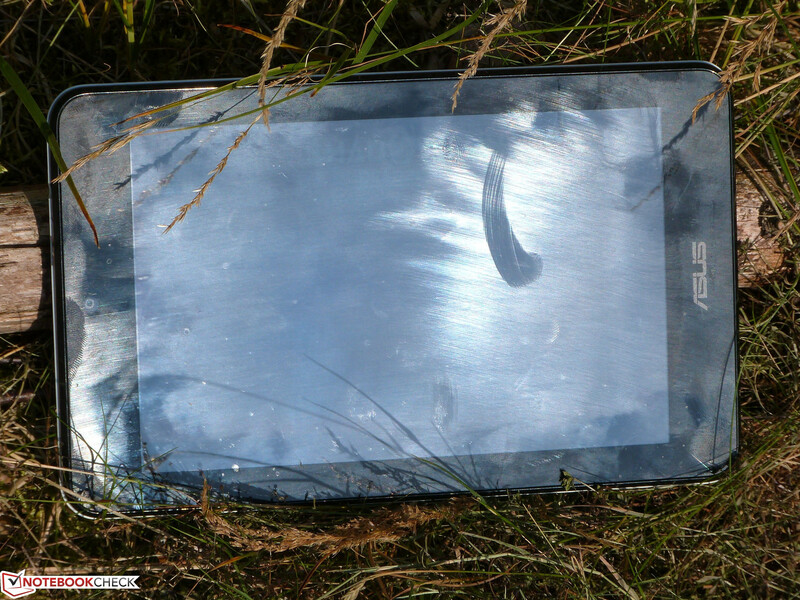 There is neither a scratchproof coating on the display nor on the rest of the case. The result is that the back basically attracts ugly scratches. However, we could not determine any problems with protruding case parts or gaps at the display. Asus had to make compromises in regard to the CPU to reach the price of 149 Euros (~$197). Fortunately, the manufacturer learned from the first Memo tablet and now integrates more performance instead of endless money saving. 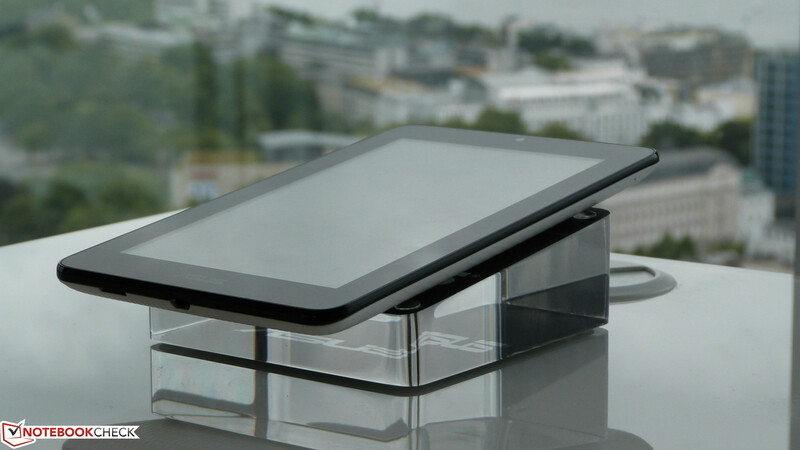 The tablet is equipped with a Mediatek quad-core ARM; the MT8125 uses four ARM-A7 cores clocked at 1.2 GHz. The performance and the feature set with the ARMv7 instruction set and NEON multimedia instructions is comparable with an A9 chip. Misgivings that the A7 could take the role of the A8, which is very popular with manufacturers but at the same time feared by customers because of the low performance, are not justified. 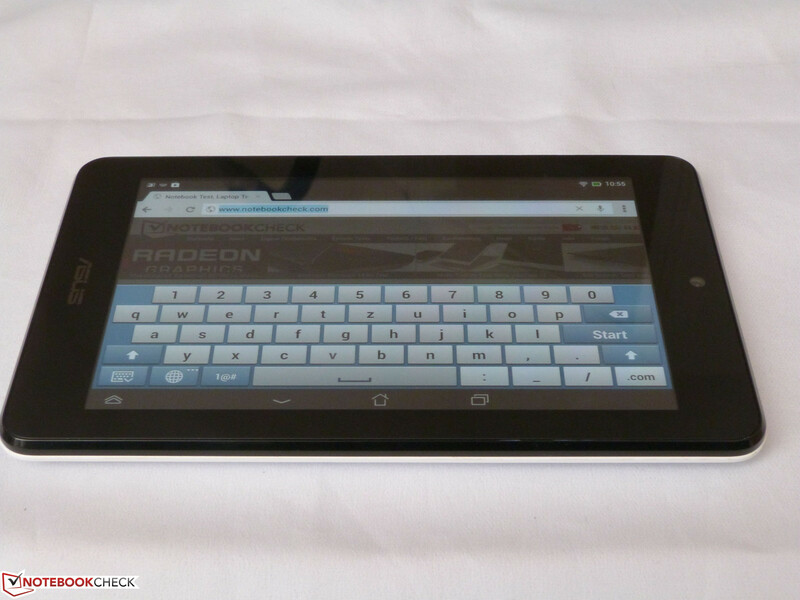 Actually the Mediatek MT8125 can compete with the Nvidia Tegra 3 that is also used in the Google Nexus 7. The SoC is supported by 1 GB RAM and a PowerVR SGX544MP GPU. The latter is sufficient for many applications but certainly no performance wonder. 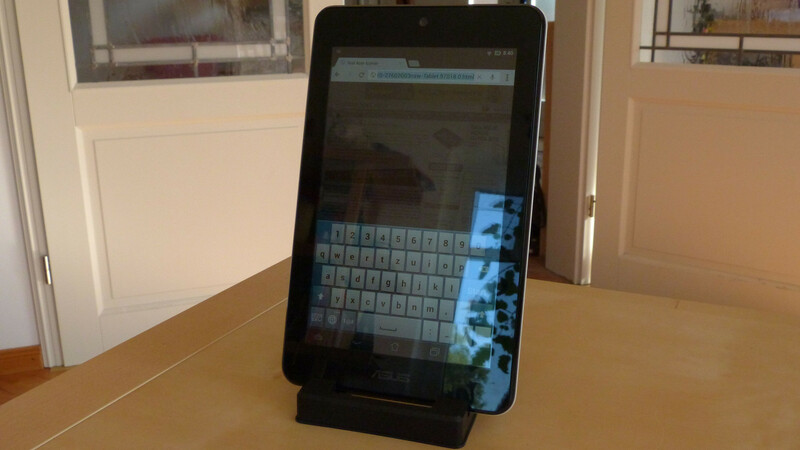 If the missing memory card slot was the only reason you did not buy a Google Nexus 7, then you can now get an Asus: The Memo Pad HD 7 has a micro SD slot; furthermore it has a 3.5 mm stereo jack and a micro USB port that can also be used to recharge the device. GPS is integrated but a compass is missing. Compared to stock Android there are just small modifications. The operating system is Android 4.2.1 but there has already been an update from Asus in our review period that enables the use of the home screen in the landscape mode and added Android Beam. Asus does not use stock Android; they slightly modified the user interface according to their preferences so you cannot immediately install the latest software updates. Google's Nexus tablets have a clear advantage in this category. 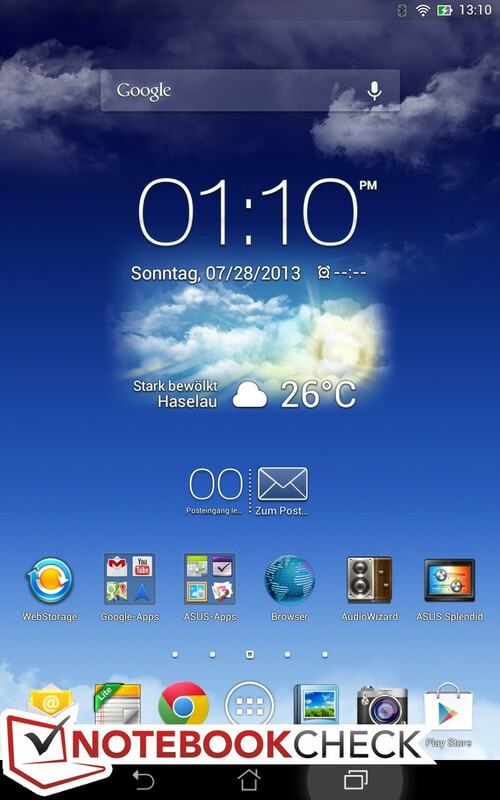 Asus also does not offer the Multi-user feature yet, although it should have been integrated in Android 4.2. There are also some preinstalled tools, for example a little drawing app, a notepad, the Kindle app and some other more or less useful applications. The additional software is not annoying and can also be deleted if you don't need it. GPS is available and reliable. Users of the Memo Pad HD 7 will have to waive 3G and LTE; WLAN is integrated and supports the 802.11 b/g/n standards. The reception was convincing in our test, even on different floors. Energy efficient Bluetooth 4.0 is also integrated. A GPS module is available and delivers an adequate number of satellite connections after 12-15 seconds; the deviation while navigating was reasonable with 5 to 15 meters. 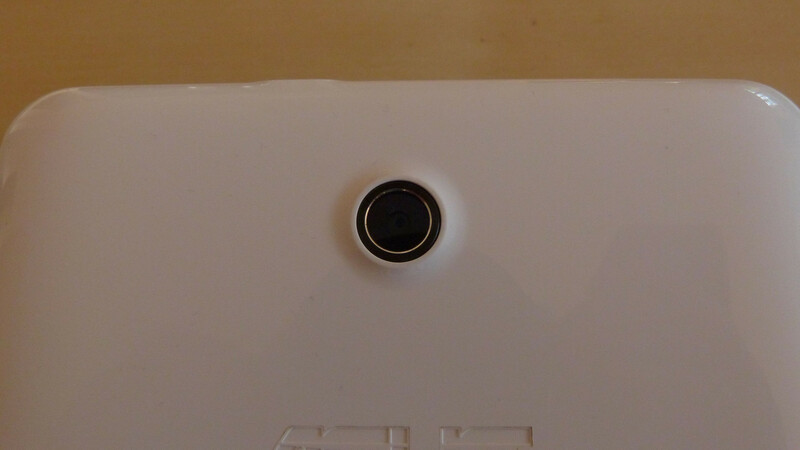 The camera at the back of the Memo Pad HD 7 has a resolution of 5 megapixels and produces average pictures. It cannot compete with an inexpensive compact camera with the similar resolution and some smartphones produce better results as well - finally the device also lacks a flash. But the quality is sufficient for the occasional snapshot. Video recordings in 1080p are quite nice and the quality is actually convenient, at least if the lighting conditions are good. The front camera only has 1.2 megapixels and the results are not very good. Pictures are blurry and less colorful but the quality is sufficient for video calls. Stand: simple plastic but still very practical. The box of the Memo Pad HD 7 is very compact and there does not seem to be much room for additional accessories. 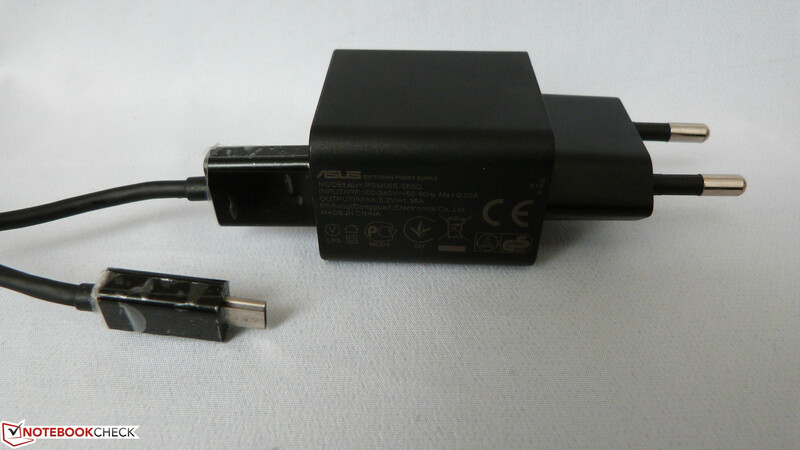 But Asus actually manages to put a little plastic stand in the box besides the tablet, USB cable and power supply unit. At a first glance it is disguised as box material but it can be used as a simple tablet stand. The warranty period in some countries is 24 months - including a pickup & return service by Asus. The manufacturer does not offer warranty extensions. 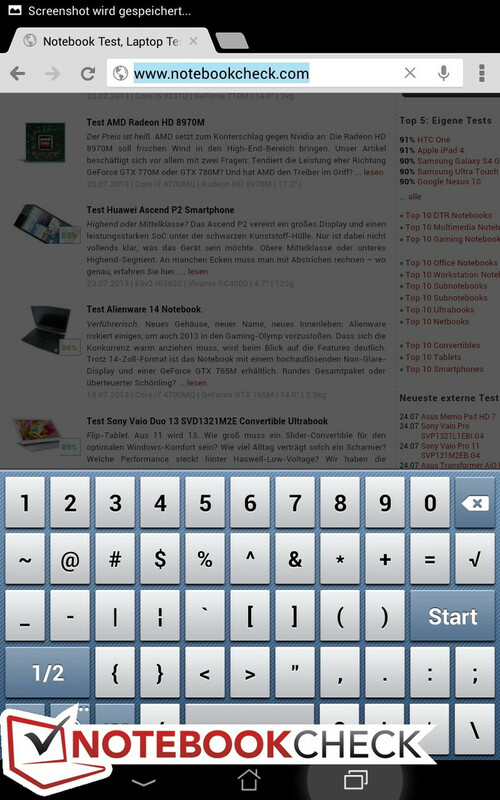 The on-screen keyboard has a very convenient number row. You can also use it comfortably in portrait mode. The virtual keyboard of the Asus offers conveniently sized keys and is easy to handle. 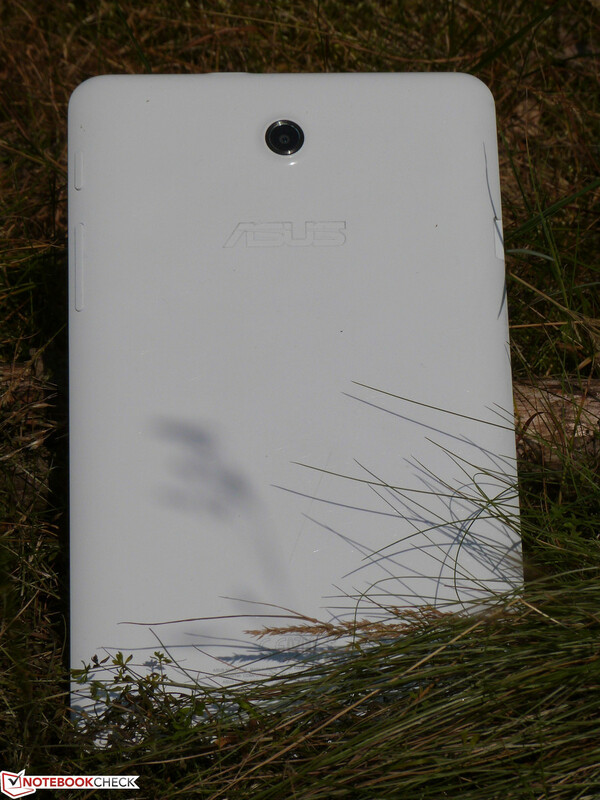 Especially practical and already familiar from other Asus devices like the Phonepad: Above the letters is a row with numbers, similar to a standard keyboard. The annoying switching between letters and numbers is gone. The automatic rotation - which can be deactivated - works reliably with a slight delay. The bottom area is reserved for Android control buttons and holding the symbol for the previously used applications creates a screenshot. Smooth working is usually no problem thanks to Jelly Bean optimizations ("Project Butter") and the quad-core processor of the Memo Pad HD 7. There is only one situation where the limited amount of RAM (1 GB) has a negative impact: Simultaneous downloading and installing of Apps from the Play Store leads to jerking and complex web pages have problems with smooth scrolling. Still readable under direct sunlight. 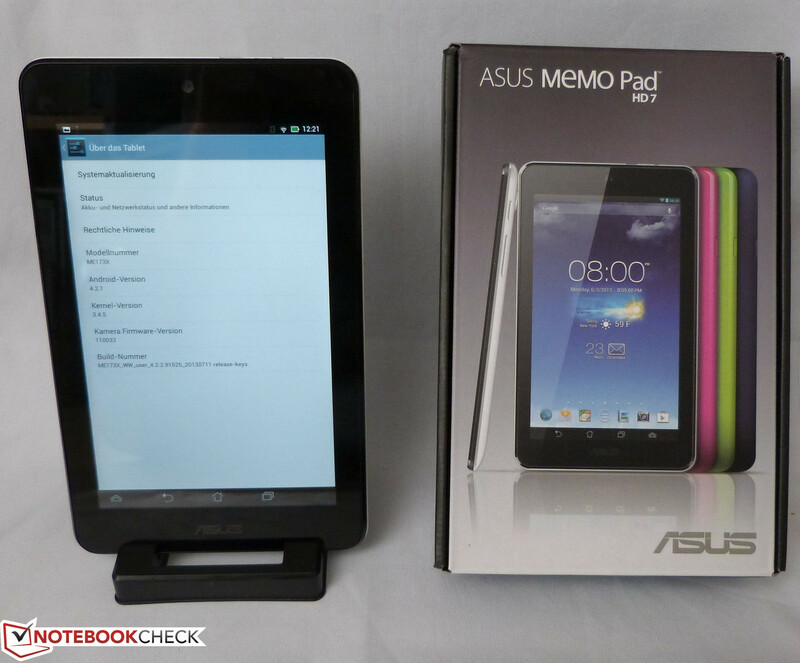 Contrary to other very inexpensive tablets, Asus equips the Memo Pad HD 7 with an IPS display. The advantage is that even unfavorable positions benefit from rich colors and contrasts, the viewing angle stability is much better compared to many inexpensive competitors like the Archos Arnova 10. 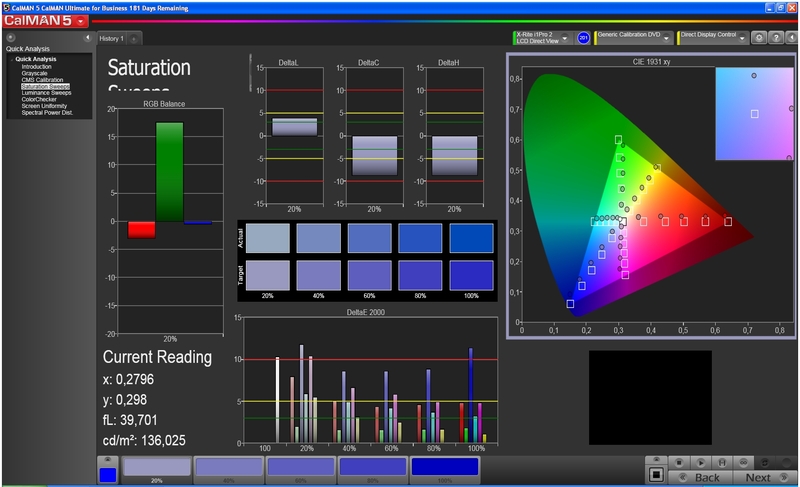 The resolution is 1280x800 pixels (widescreen) and the pixel density is sufficient with 216 ppi. Another advantage of the device is the brightness - 350 cd/m² provides a bright picture even outdoors but you should still avoid direct sunlight due to the glossy surface. The brightness distribution is very consistent. Asus did not integrate an automatic brightness sensor to adjust the brightness according to the situation. We did not miss such a feature in our review, the battery runtimes were very good even without the automatic brightness reduction. If you expected a tablet with limited features and a bad display for the price of 149 Euros (~$197) for the Asus Memo Pad HD 7, you will be pleasantly surprised. Asus does not integrate a high-end display known from higher priced devices, but at least it is a comparatively high-quality IPS display. 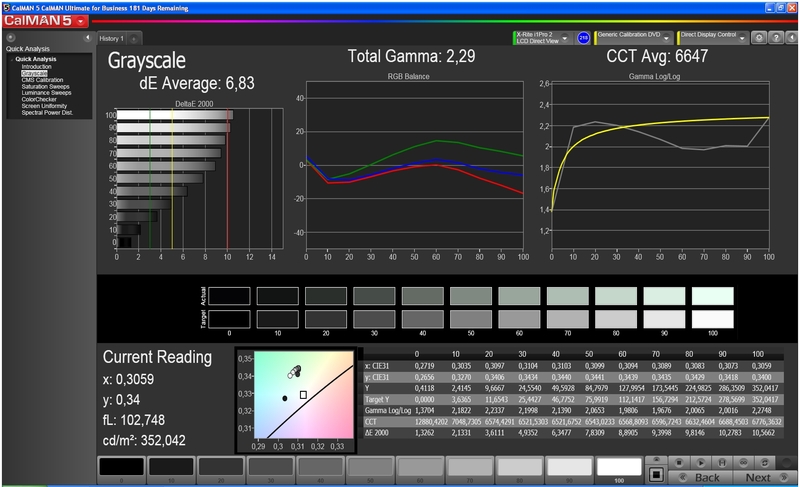 The contrast ratio is 547:1 and does not cause any criticism despite the low result, at least subjectively. The impression during operation is extremely positive: Blacks are very dark, which especially benefits games and movies; movie playback is no problem even in a shady environment. The color accuracy does however suffer from red cast. It is very apparent in our CalMAN comparison screenshots but does not have a big effect on daily tasks. 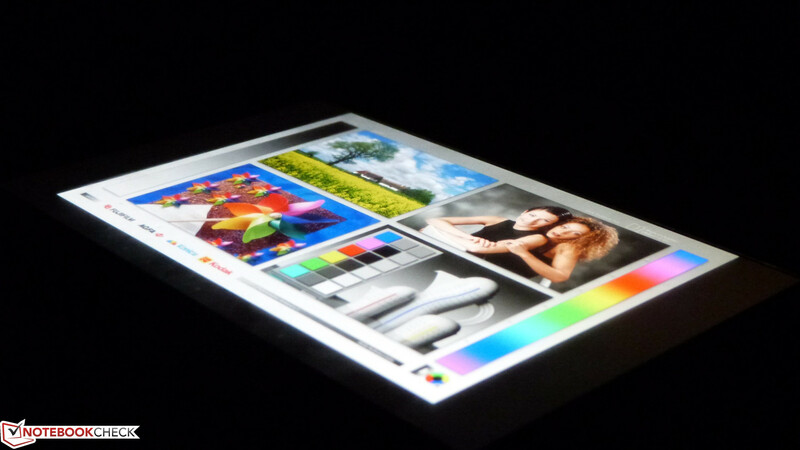 Orange colors drift into red but that is only a problem if you are looking for a tablet for professional picture editing. In this case you should get an iPad or Sony's Tablet Z.
CalMAN 5: The display has a red cast. CalMAN Grayscale: You can also see some red. Good usability in the shade. 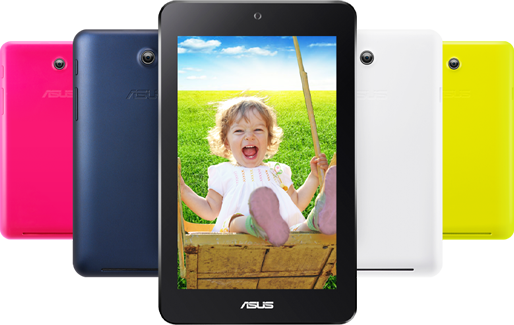 Although the Asus Memo Pad HD 7 is equipped with a typical glare display, it can compensate for that disadvantage with the excellent brightness. 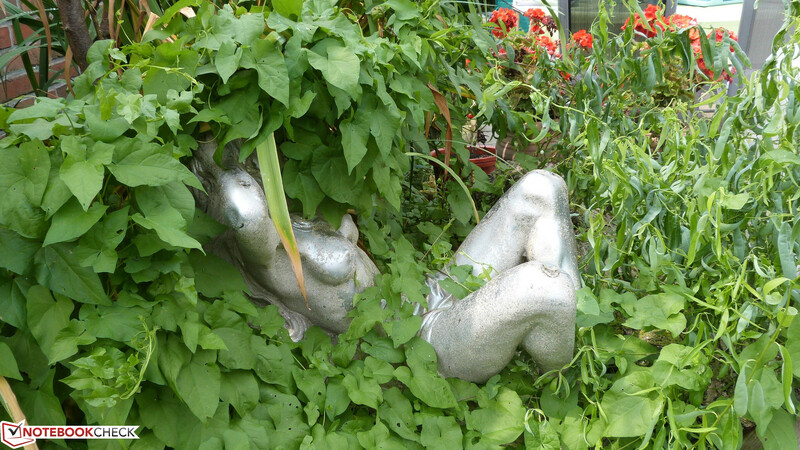 You still have problems with the visibility under direct sunlight but bright environments are no problem at all. 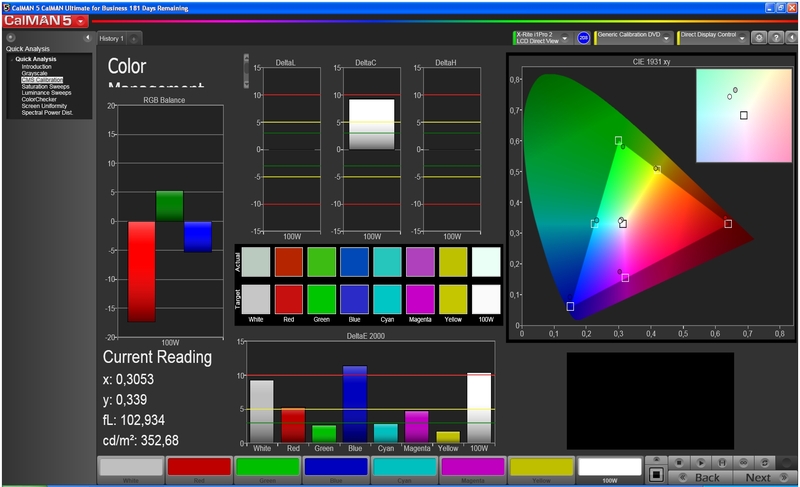 The IPS display with very good viewing angles. Compared to other more expensive tablets with IPS displays, the colors of the Asus Memo Pad HD 7 get a bit pale with very small viewing angles. But the viewing angles stability is still better than we would expect from this price range. 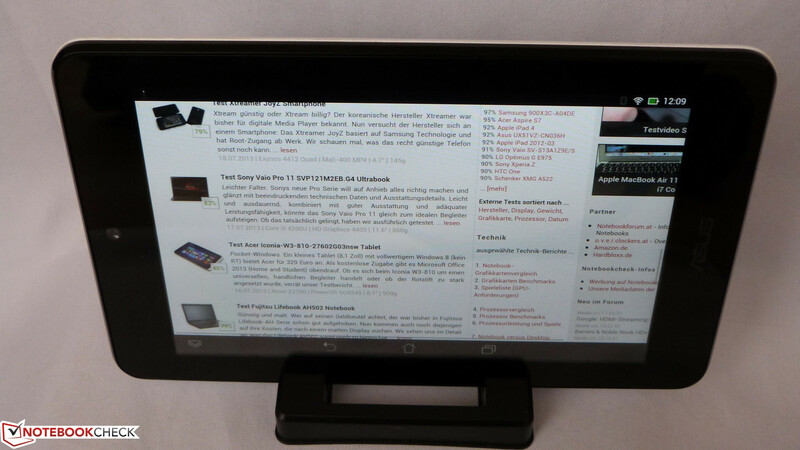 Only Google's Nexus 7 has a similarly good display and the second generation also comes with a higher resolution. Our benchmarks show that the A7 is not only suited as energy saving core in bigLittle configurations with A15 cores, but also as a main processor in entry-level and mainstream devices. The performance of the Mediatek quad-core in the HD 7 is not worse compared to a similarly clocked Cortex A9, which can still be found in many entry-level tablets. Due to the 28 nm manufacturing process and numerous internal optimizations by ARM, the SoC is pleasantly frugal. As a result the tablet does not really get warm even after hours of gaming and the battery runtimes are good despite the small battery. The SoC does not offer the same performance of a Krait based Qualcomm S4, for instance, and the PowerVR graphics only offers average performance at best - but the performance is still reasonable for a 149 Euros (~$197) tablet. The direct competitor Google Nexus 7 with its Nvidia Tegra 3 is always ahead of the Memo Pad HD 7 in the 3D benchmarks. 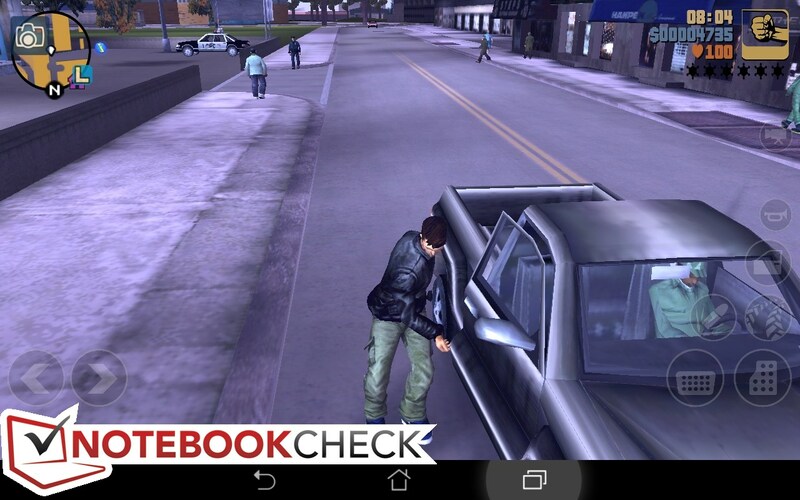 But this advantage is not directly apparent during normal operation where most of the Android games run very smooth. 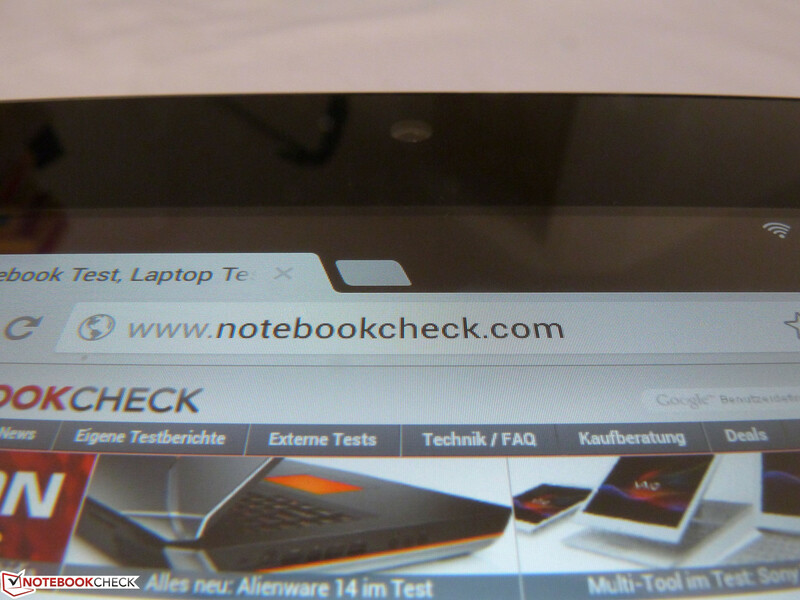 Web browsing is also very convenient and the Memo Pad HD 7 can even beat the Samsung Galaxy Tab 3 7.0 and the Nexus 7. We could not determine any delays while reloading web pages. Mediatek uses the PowerVR SGX544; the graphics chip does not really provide the best benchmark results but offers reasonable performance for the price category of the Memo Pad HD 7. Games like Bards Tale, Max Payne and GTA III run very smooth even with high details and the results look very good. We had no problems with games that would not start, some more exotic SoC's often refuse to start half of the games in the Play Store. 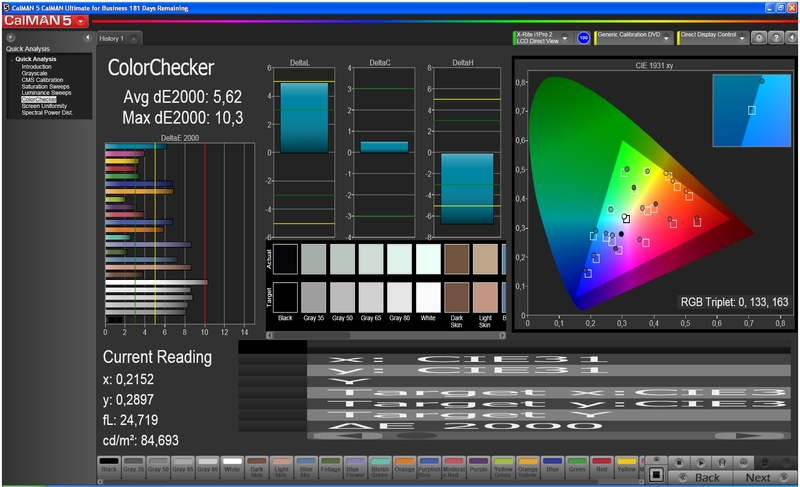 The synthetic benchmarks show the average performance of the graphics chip. 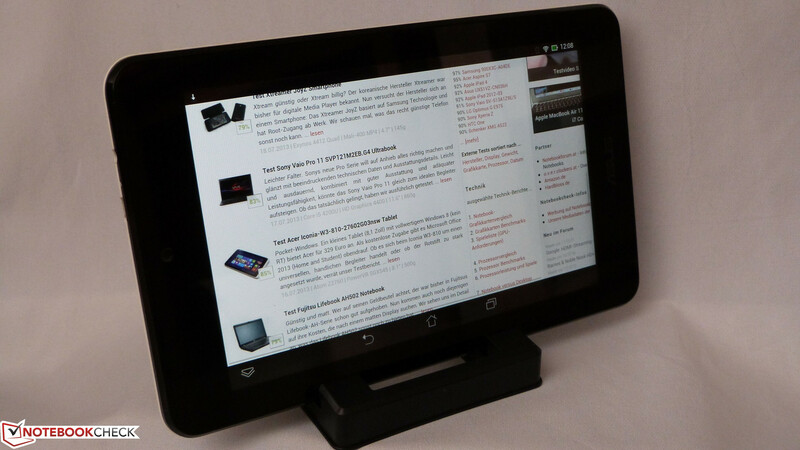 The results cannot compete with the Google Nexus 7 (first generation) but are sufficient for most applications. There is not much potential for upcoming games but that should be acceptable considering the price of 149 Euros (~$197). The small memory has a bigger impact with just 1 GB, we had to wait a couple of minutes before the level of the otherwise smooth NOVA 3 was loaded, for example. Bards Tale runs very smooth and the controls work well. GTA III was no problem either. 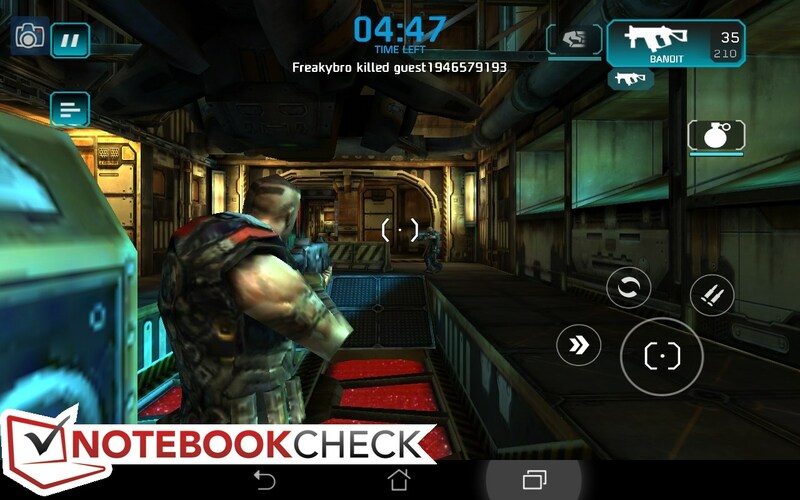 Shadowgun with nice and smooth graphics. 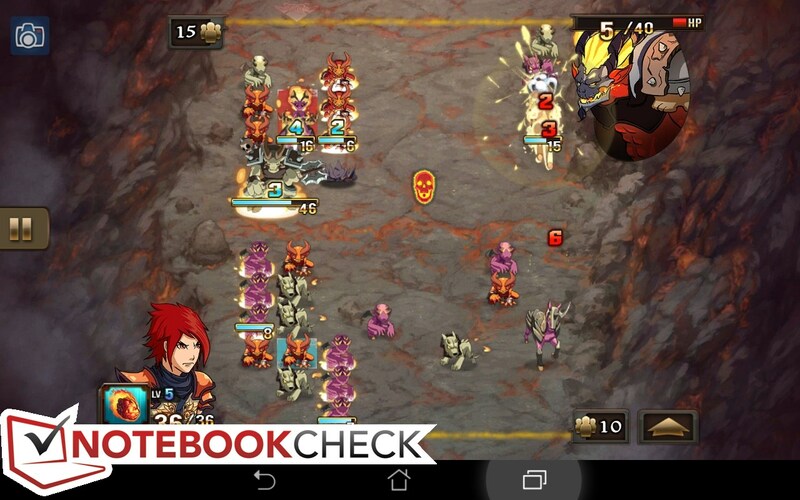 Recommendation: Might&Magic Clash of Heroes with addictive potential. 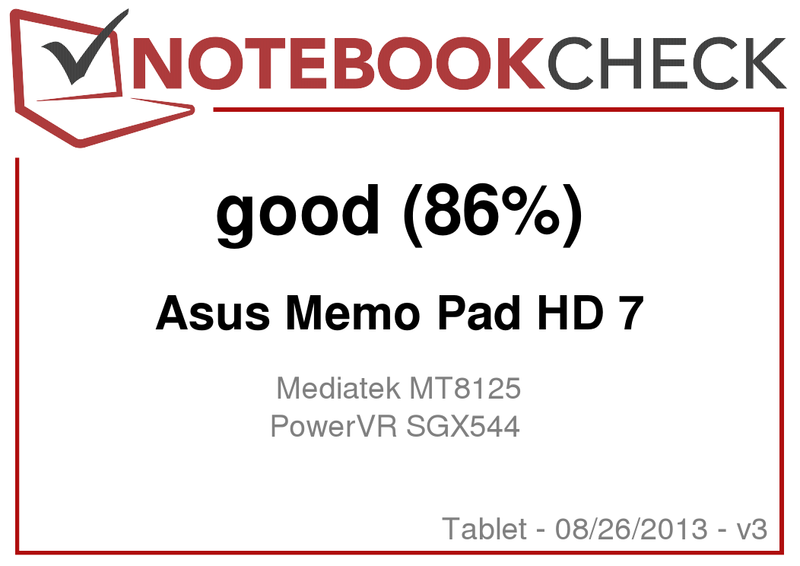 The 28 nm manufacturing process of the Mediatek SoC pays off: The temperatures of the Asus Memo Pad HD 7 are very low even under load. The highest measurement after our one hour stress test was 37 °C at the back left, but the tablet can still be used on the lap with these temperatures. Daily tasks confirm our measurements. Even several hours of gaming with current games did not result in uncomfortable temperatures or unstable operation at any time. Even in the warmed up and not air-conditioned car it was always a reliable companion. The plastic back does not really warm up at all, quite contrary to many expensive tablets with their otherwise high-quality aluminum cases. The mono speaker of the Memo Pad HD 7 is not very powerful but does not distort either. As a result bass is almost nonexistent. However, in this price and performance class there is hardly any competitor with a better sound experience. 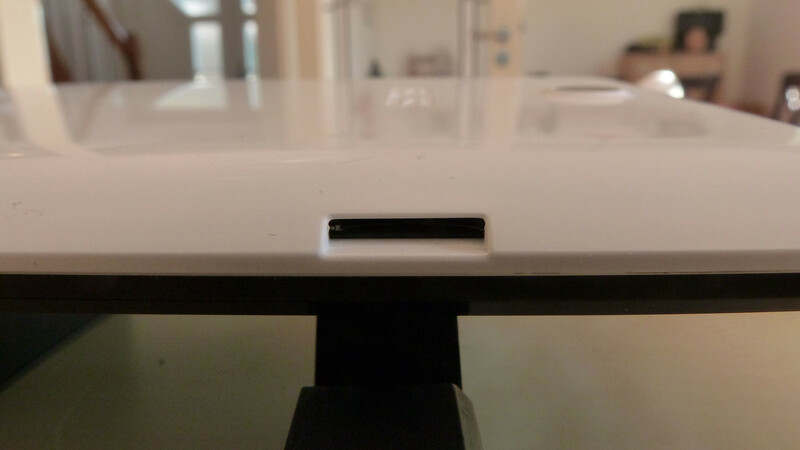 The speaker is never completely covered due to the rounded back of the tablet. You do not have to turn the tablet around to understand anything. There is also a 3.5 mm stereo jack if the speaker is not sufficient. The sound quality is good and we did not notice any background noise. Our measurements with the Voltcraft VC 940 show that the Memo Pad HD 7 is very frugal; between 2.4 and 4.3 Watts during idle - the latter with maximum display brightness and activated wireless connection. This is around 1 Watt lower during idle than the iPad Mini, for instance. The consumption rises to 5.5 Watts under load - still a very good result for a quad-core tablet. The consumption values are even below the first Memo Pad although that was just equipped with a single-core CPU and less memory. 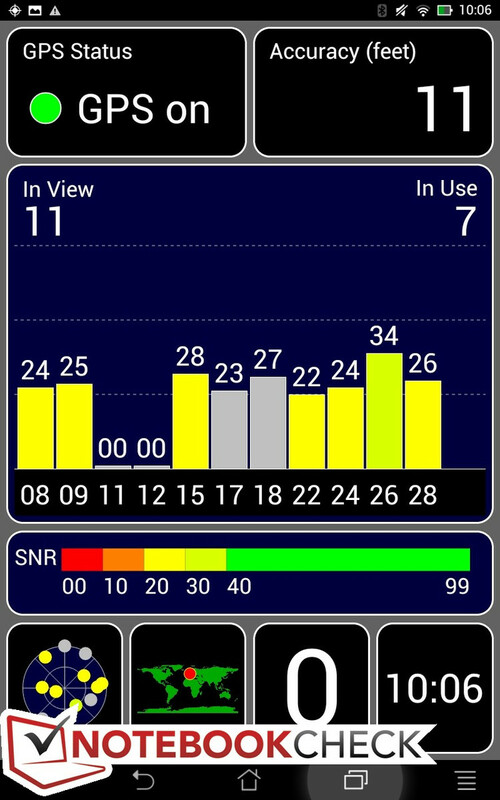 We measure 0.7 Watts during stand by and the consumption is 0.0 Watts when the device is turned off. 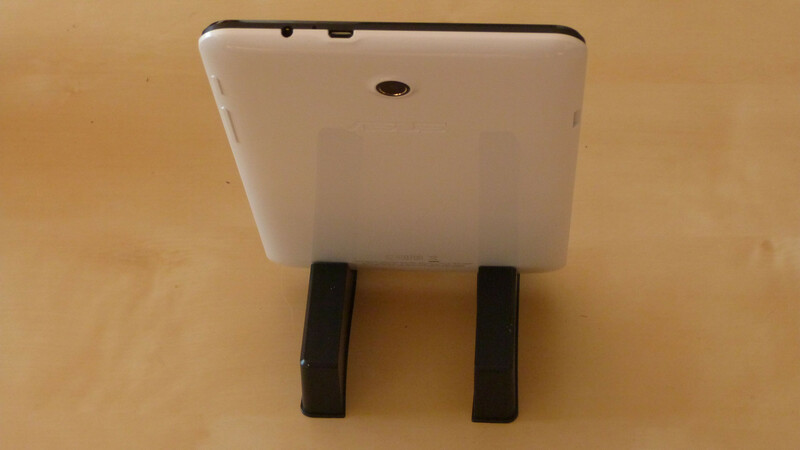 Compared to its main rival, the Google Nexus 7, the Memo Pad HD 7 should have a disadvantage, at least in theory. The non-removable battery of the Memo Pad HD 7 has a capacity of 3,950 mAh (16 Wh), the Nexus 7 has 4,325 mAh (19 Wh). But the 28 nm manufacturing process of the processor shows its advantages in real life applications. Compared to the ancient 40 nm Tegra 3, the A7 quad-core consumes considerably less energy - even Nvidia's "Nina-Core" cannot compensate for that. 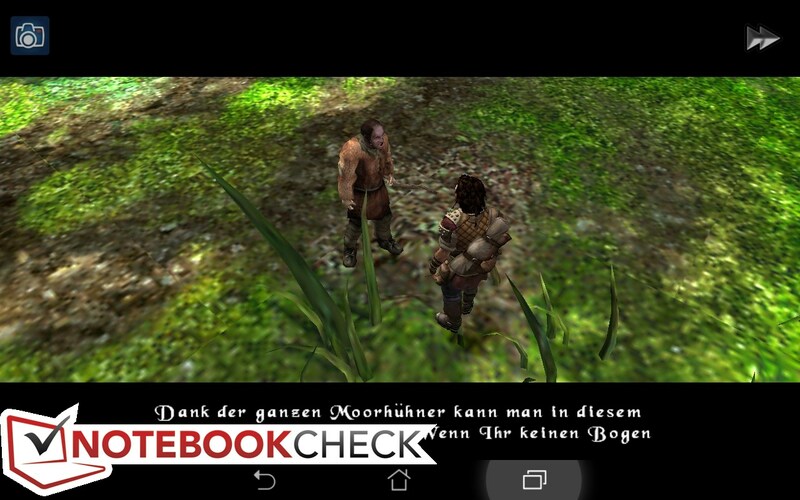 During idle, with deactivated WLAN and minimum brightness, the Memo Pad HD 7 lasts a very good 17 hours. The more realistic Battery Benchmark resulted in 14 hours - still a good result. 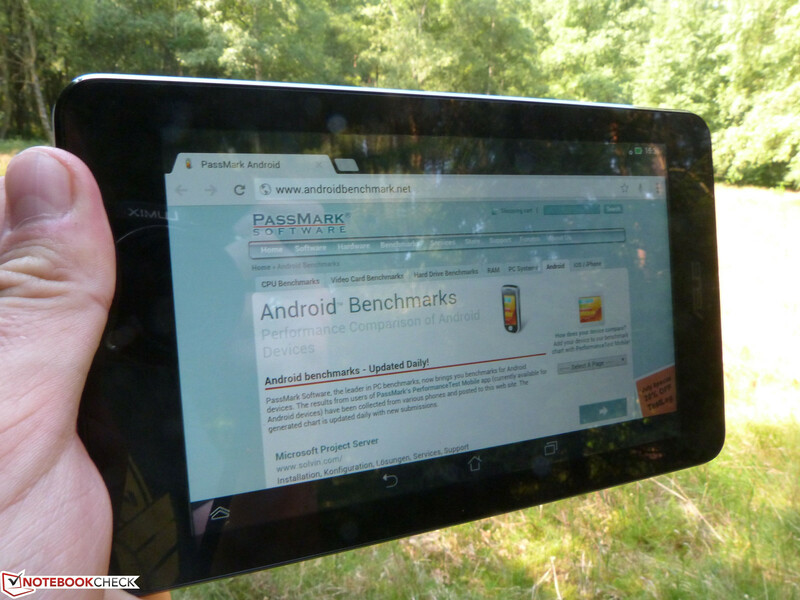 The tablet manages 7:45 hours web browsing with activated WLAN and almost 5 hours under load. All in all, very good results. 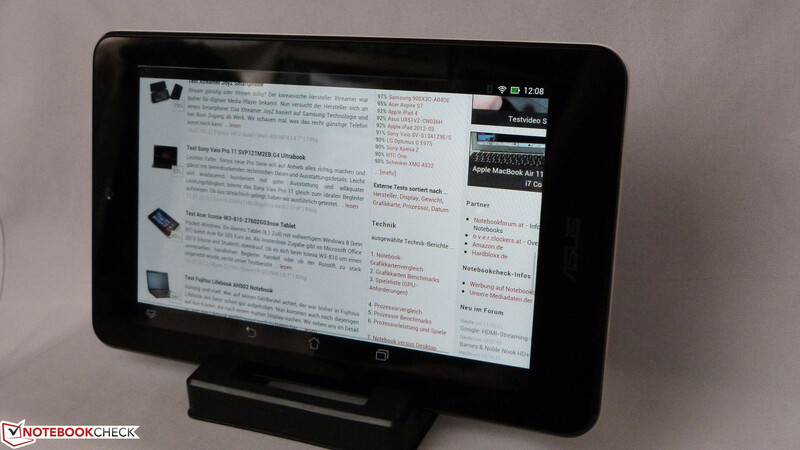 Well-balanced tablet for a low price: Asus Memo pad HD 7. With a retail price of 149 Euros (~$197) the target groups for the Asus Memo Pad HD 7 are bargain hunters, users looking for a second device and people with limited interest in technology. 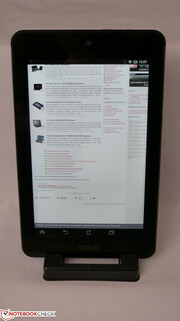 Asus manages to offer a very good device for this price, which could also be the only tablet in the household. We were surprised by the comparatively good performance of the A7 quad-core CPU; it is on the same level with Nvidia's Tegra 3 - which was a high-end processor only one year ago. But the energy consumption is even more important and the Asus tablet does not disappoint thanks to the 28 nm manufacturing process. The only drawback is the limited memory equipment. 1 GB is not very generous nowadays, some applications need some time to start. Simultaneous installation of applications while running another one resulted in delays. The graphics chip could also have been faster but the performance is sufficient for current Android games. We can still give a recommendation for the Asus Memo Pad HD 7. Compared to the new Nexus 7 you can save 80 Euros (~$106) - even if the first Nexus 7 was available with a reduced price, the Memo Pad HD 7 would still be the better overall package. 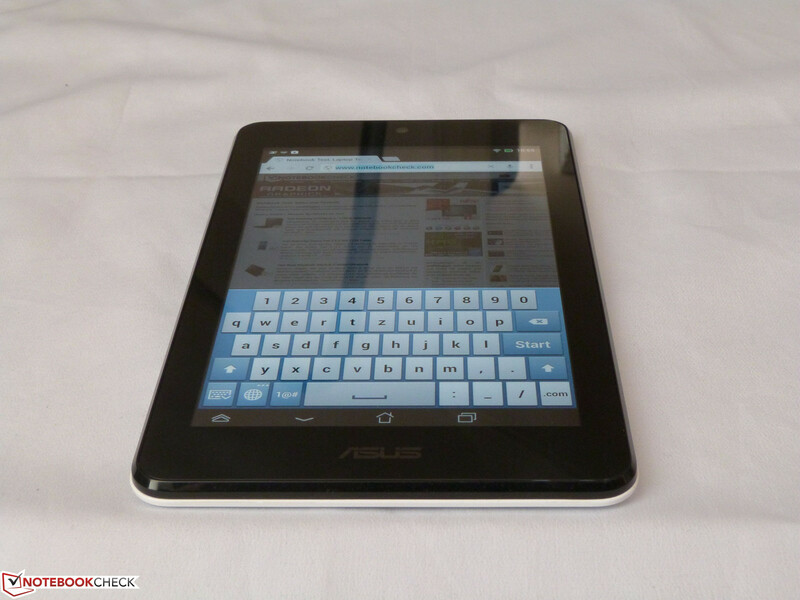 In Review: Asus Memo Pad HD 7. Courtesy of: Asus Germany. 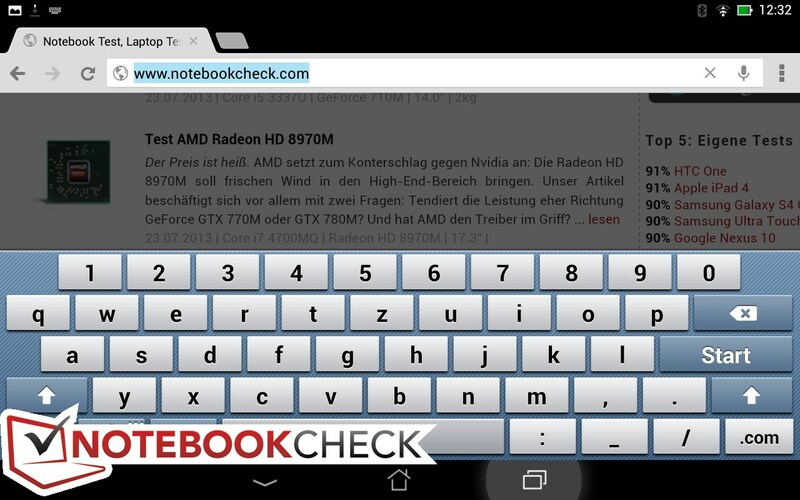 The on-screen keyboard is convenient. You can even use it comfortably in portrait mode. The display content is hard to see under direct sunlight. 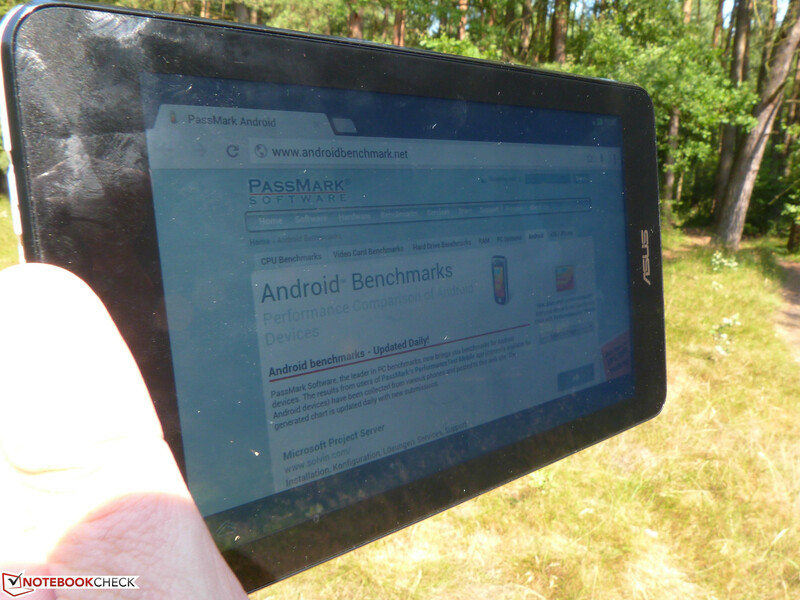 At just around 300 grams the tablet is very compact. The back is not very robust and gets scratched very easily. Thanks to the IPS display you can use the Memo Pad HD 7 in almost every position. Nice advantage over the Nexus 7: A micro SD slot. The power supply unit is small and needs quite some time to recharge the device. The provided USB cable is not very long. 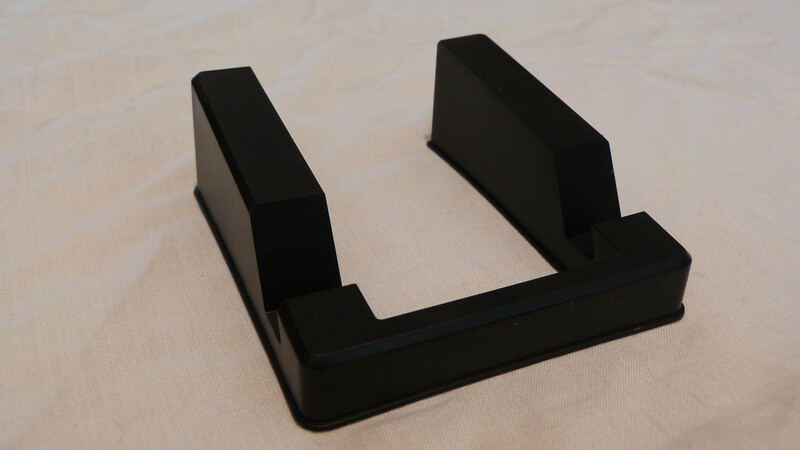 The provided stand is very convenient although it looks wobbly at first. Looks good in portrait mode as well. The camera on the back creates nice pictures, at least under good lighting conditions. 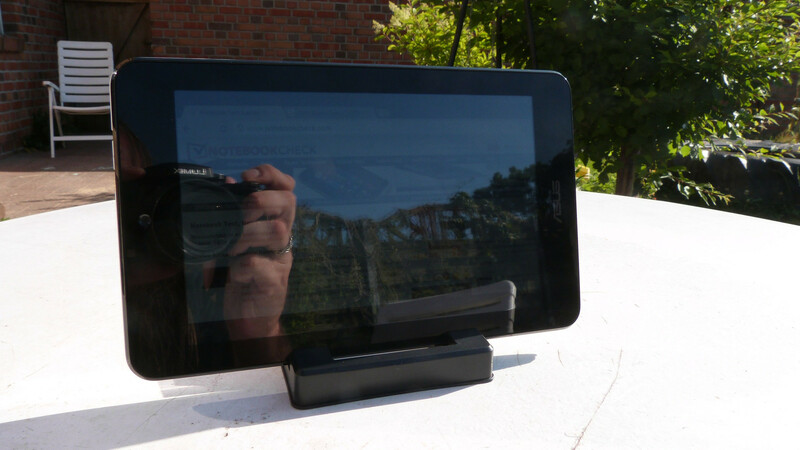 Thanks to the stand you can also use it as a digital picture frame or music player. 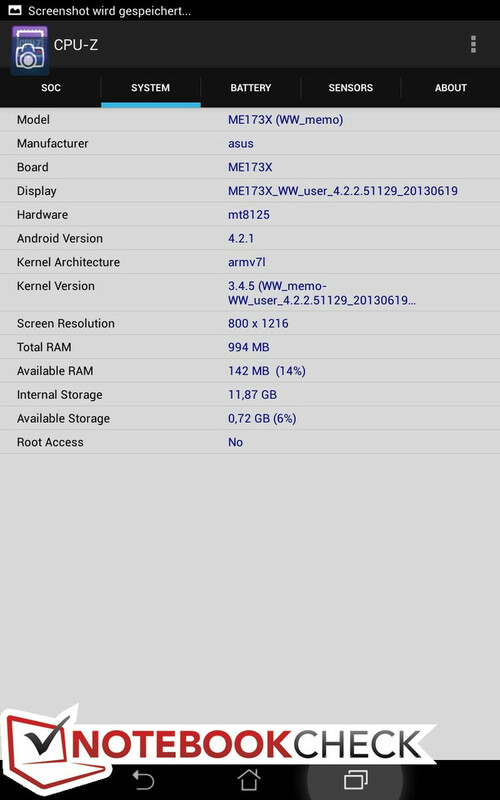 CPU-Z already knows the SoC of the Memo Pad HD 7. Games like Clash of Heroes (and even more demanding titles) run perfectly. 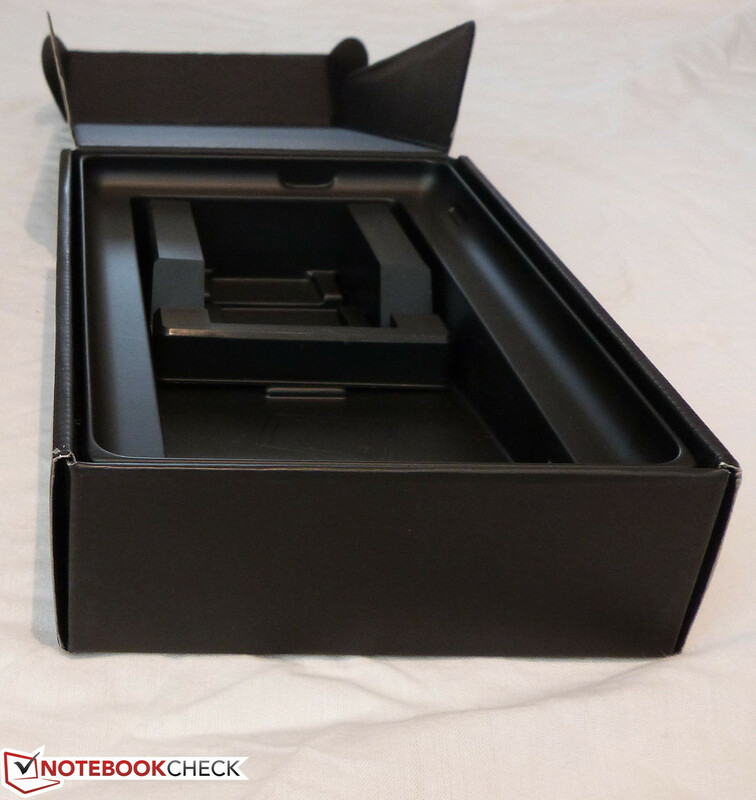 Cleverly hidden in the box: The stand of the Memo pad HD 7. Portrait and landscape mode: Handling the device is fun. Typing is quicker in landscape mode. Most Apps from the Play Store run without problems. The box of the Memo Pad HD 7 is simple and compact. Asus does not waive the advertisement for its own company. 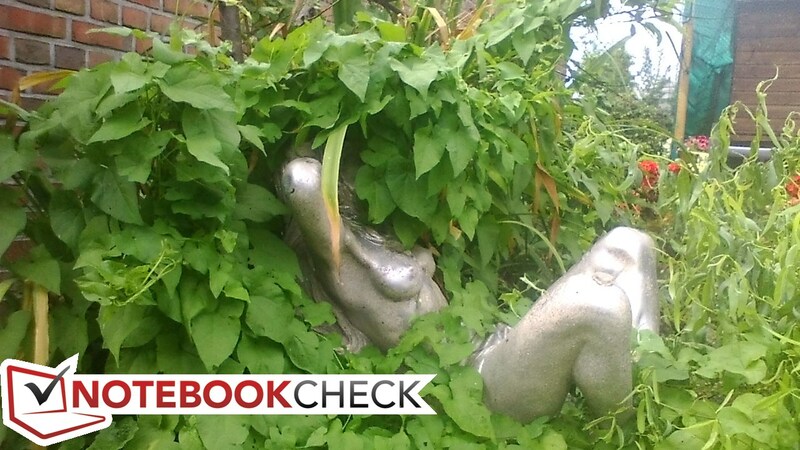 Search: Where is the stand? Small, compact, long battery runtimes and sufficient performance. Many advantages for a very low price. HDMI would have been nice. We did not expect 3G or even LTE. 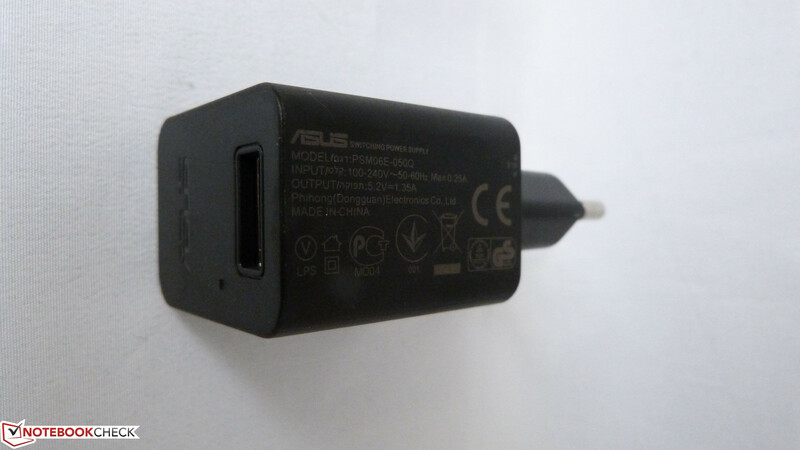 USB-OTG could be patched, maybe Asus will read this. A very good tablet for 149 Euros (~$197) - for example as a second device. 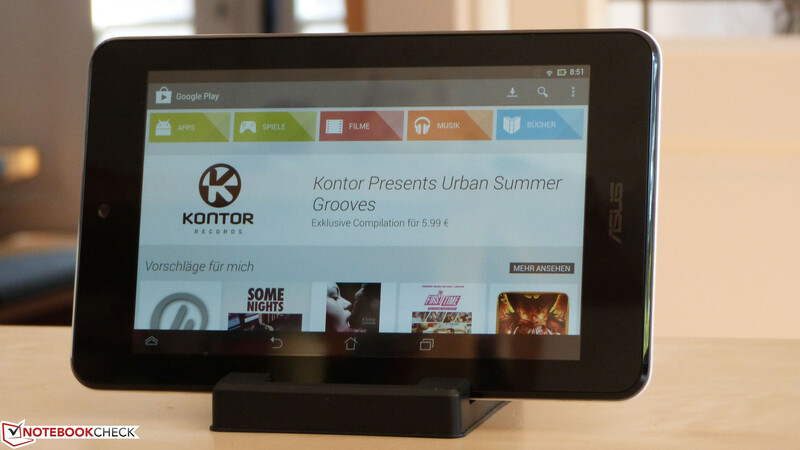 The direct rival is obviously the Nexus 7 - which is also manufactured by Asus. It has a similar performance but no camera at the back and no micro SD slot either. Other inexpensive tablets like the Archos Gamepad or the TrekStor SurfTab Ventos 7 are available for the same price, but offer considerably less performance.